Why do we travel? I know that people travel for diverse reasons. For my part, I travel to learn. If I want to learn about some part of the world, I find that there is no substitute for actually going there in person, walking around, talking with people (if I can), making notes, and taking pictures. But I can only learn so much from travel. To get deeper knowledge, I need to read books written by people who are more experienced and knowledgeable than me. Travel and reading go hand-in-hand. My travel experiences make me pay more attention to parts of the books I read, and often my reading makes me want to go back to a place to pay more attention to something I had missed before. Here is an example of how reading can help me better understand a place I have visited. I have been reading Distant Neighbors: A Portrait of the Mexicans, by Alan Riding (1983, revised edition published in 1986). This was a lucky used bookstore find. Riding is a British journalist, but he wrote the book for an American audience. In the introduction, he argues that Americans hardly understand Mexico at all, and we need to understand the country better. This is why he wrote the book. I agree that Americans really don’t try to understand our southern neighbor. Apart from the drug wars near the US border, Mexico does not appear in American news very much. When we teach world history at the college level, Mexico has its fifteen minutes of fame during the Aztec conquest. Then it disappears. My knowledge of post-1521 Mexico is therefore almost a complete blank, and so I have had plenty to learn from Distant Neighbors. According to the book, the man who really created modern Mexico was Miguel Alemán, who served as president of the country from 1946 to 1952. Alemán opened the country to large-scale foreign investment. This was when American companies like Ford and Coca-Cola entered Mexico. Thanks in large part to American investment, the Mexican middle class grew rapidly during Alemán’s presidency and afterward. 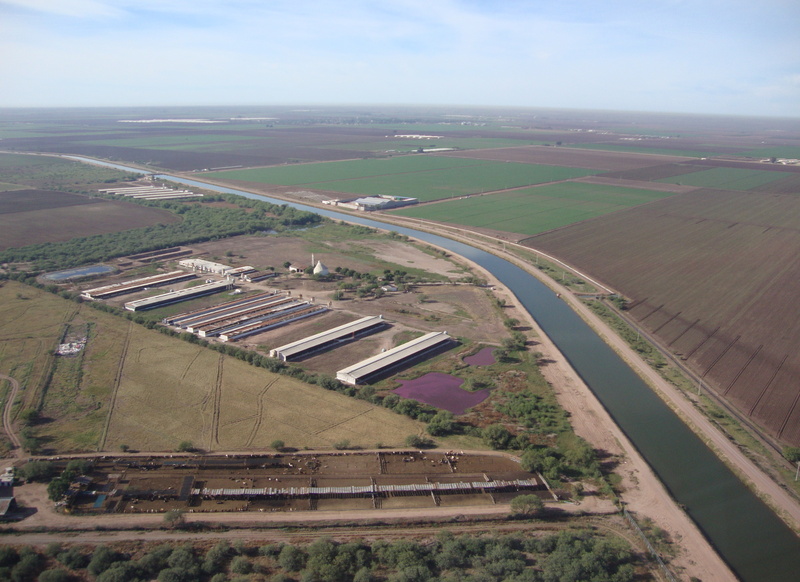 Alemán also invested in big irrigation projects to promote agriculture in Sonora and Sinaloa. These two states are in arid northwestern Mexico. Sonora is just across the international border from Arizona; Sinaloa is the next state south of Sonora. Alemán wanted farms in northwestern Mexico to grow crops on a large scale, with irrigation and fertilizers, like farms in the USA. Most of the agriculture in these two states is organized in large farms, either privately-held latifundios, or sometimes a collective of small holdings known as ejidos granted to the Yaqui and Mayo people in government land-reform programs. American-style agriculture outside of Ciudad Obregon, Sonora, northern Mexico. A couple of years ago, I visited the town of Ciudad Obregón in Sonora. (See “An Audience with Dr. Borlaug” for more information about Obregón.) I saw the large-scale agriculture, but I didn’t know why or when the countryside was developed in that way. I also didn’t know why the main street in Obregón is named Calle Miguel Alemán. (“Calle” means “street.”) Now, thanks to Alan Riding’s book, I do. View of countryside outside of Ciudad Obregon, Sonora, Mexico. Outside of Ciudad Obregon, in the northern Mexican state of Sonora, massive plots of cultivated land stretch for miles and miles into the distance. Agriculture on such a large scale is necessarily mechanized: tractors plow the fields, airplanes spray pesticides on the crops, mechanical harvesters pluck the wheat, and trucks carry the crops to town, from whence they are shipped to markets near and distant. Watching over this agricultural activity with a look of intense determination is the statue of a young norteamericano, mounted on a monument within an agricultural research station outside of the city. The statue wears work boots, jeans, a brim hat, and a shirt with the sleeves rolled up above the elbows and the top two buttons undone. 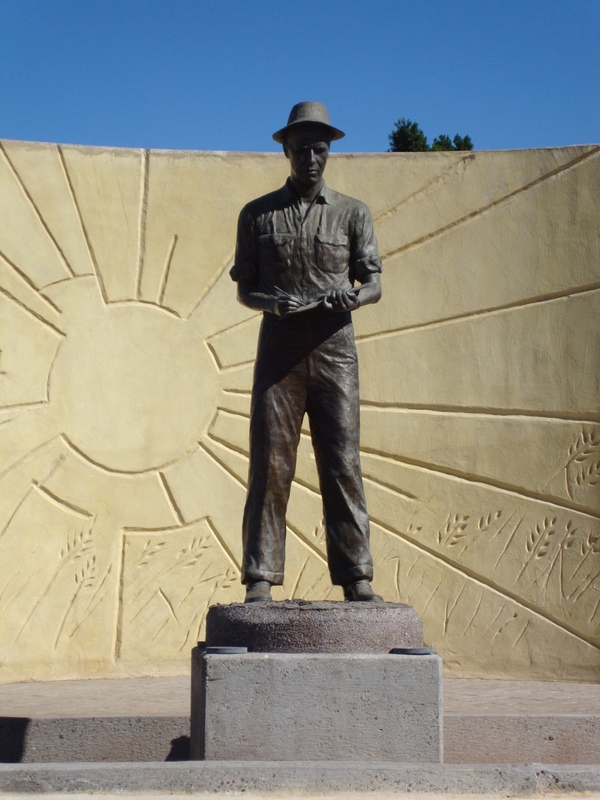 He is Dr. Norman E. Borlaug, and the research station where his statue is mounted is named in his honor. American-born Dr. Borlaug is probably the most famous figure of the Green Revolution, an international movement in the 1960s and ’70s that dramatically increased crop yields in poor countries such as India and Pakistan. In the eighteenth century, Thomas Malthus had famously argued that since human population grows exponentially, populations must suffer violent reductions from time to time by famines or other disasters. Dr. Borlaug and other green revolutionaries realized that they could circumvent so-called “Malthusian checks” by exponentially increasing food supply to keep pace with population growth. Borlaug’s strategy was to selectively breed dwarf strains of wheat, which had shorter stalks and thus wasted less energy on growing the parts that humans can’t eat. To do this, he cross-bred wheat from his low-land station at Obregon with strains from a highland station in southern Mexico. (Researchers did similar work on rice at a station in the Philippines.) Borlaug’s dwarf wheat did produce higher yields than traditional strains, and for his efforts he won the Nobel Peace Prize in 1970. 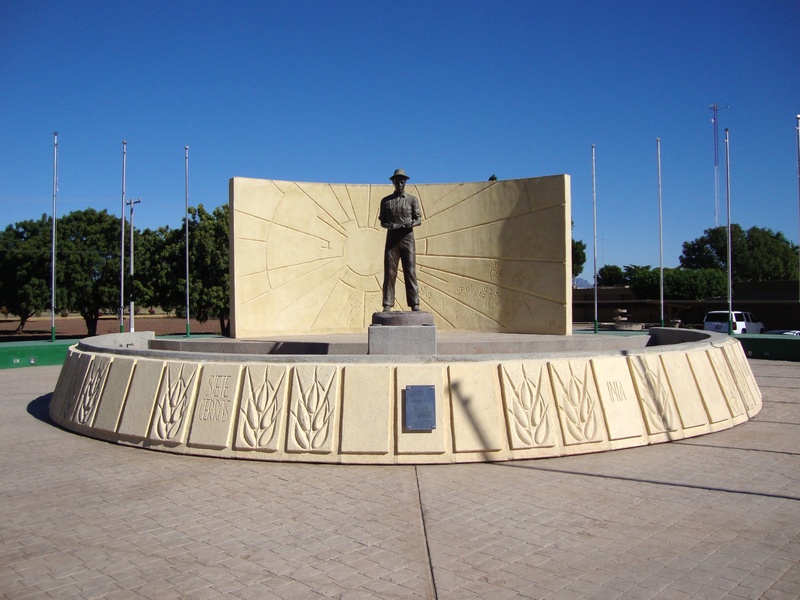 The monument in Obregon personifies Borlaug as the Green Revolution. A low, curving wall in front of Borlaug’s statue bears the names of wheat varieties that he helped develop. On the back of the monument, an impressionistic relief shows women and children looking hopefully into the distance. 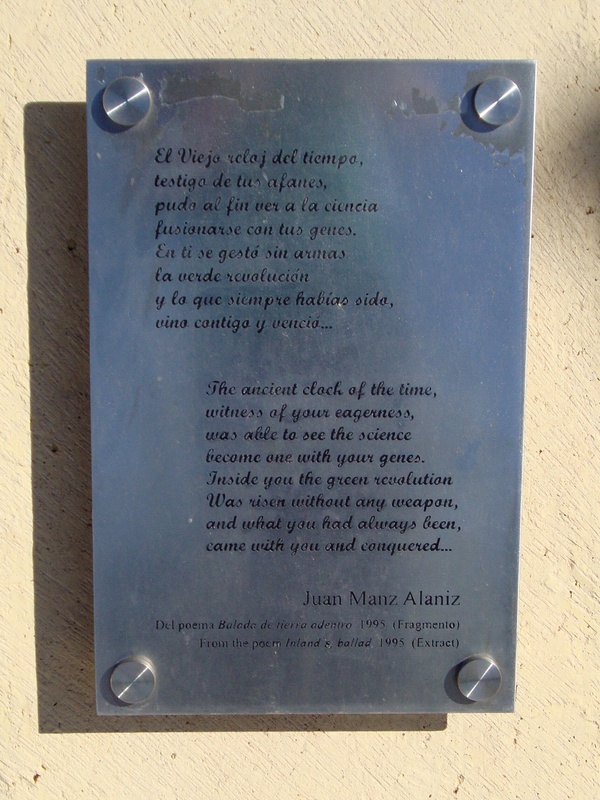 The dedication plaque, with text in both Spanish and English, reveals that the monument is also a gravesite; Borlaug’s remains were interred here after his death in 2009 at the age of 95. A bilingual plaque (not the dedication plaque) that personifies the Green Revolution as Dr. Borlaug. The legacy of the Green Revolution is very much a part of our twenty-first century world. This legacy is problematic. Critics claim that the Green Revolution only delayed another inevitable Malthusian crisis. It also heightened environmental damage caused by industrialized agriculture. 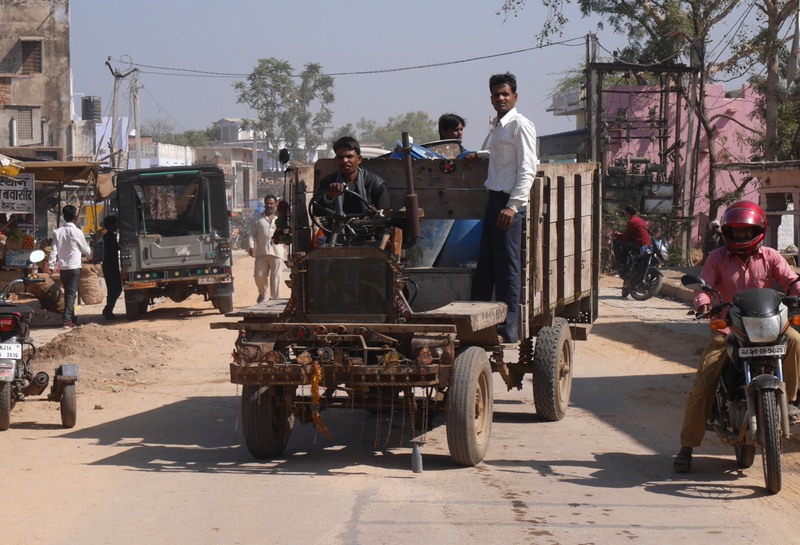 The Green Revolution was not “green” in contemporary parlance. It is not related to the organic farming movement; quite to the contrary, Green Revolution agriculture uses not only highly-specialized crop strains, but also pesticides and chemical fertilizers. 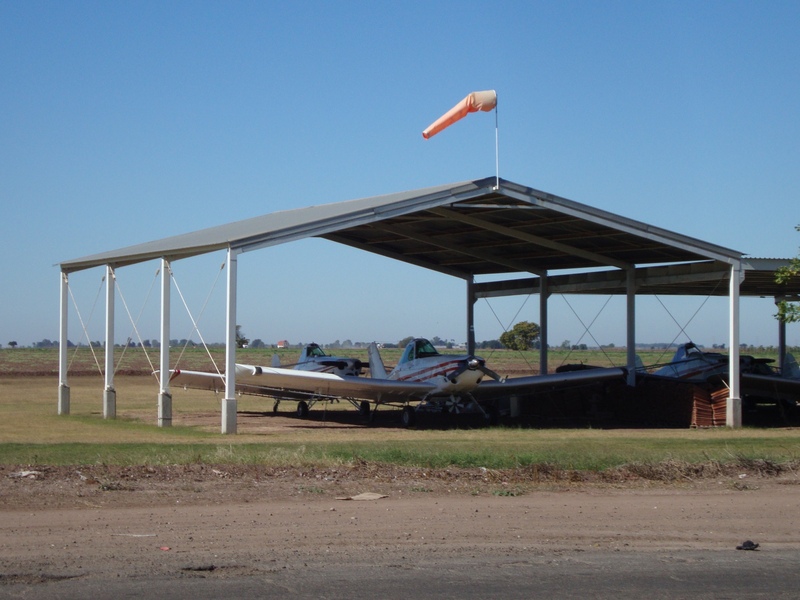 It is therefore only fitting that across the road from the Borlaug research station there is an airstrip where several cropdusters are based. Cropdusters outside of Ciudad Obregon.